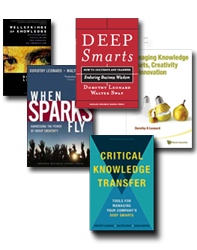 Critical Knowledge Transfer: Tools for Managing Your Company's Deep Smarts. When managers, scientists or engineers transition to other positions or retire, what happens to their critical business knowledge developed over many years of experience—what Dorothy Leonard and Walter Swap have described as deep smarts? Building on their best-selling 2005 book, Deep Smarts: How to Cultivate and Transfer Enduring Business Wisdom, Leonard and Swap, with Gavin Barton, discuss the obstacles to sharing knowledge, particularly tacit knowledge, and how those obstacles may be overcome. They identify the players who must be involved in an effective knowledge-transfer initiative, and how they can best be prepared. They then describe a number of specific tools and techniques for identifying where the deep smarts reside within the organization, and how they may be elicited and shared with successors. The authors draw on current research findings (including the results of a survey of top executives designed specifically for this book), numerous case studies and interviews with high-level executives, scientists, and engineers. The book includes a detailed case study of how GE Global Research, working with the authors, developed an effective knowledge-transfer project. This is a book that provides both a deep dive into the nature of deep smarts, and practical tools for the HR or other executive concerned with the loss of knowledge. Individuals will also find ample resources for deepening their own smarts. Steve Phillips, Chief Information Officer, Avenet, Inc. Managing Knowledge, Assets, Creativity and Innovation. In a single volume, this selection of Dorothy A. Leonard's work covers innovations from their inception in people's heads to their implementation. While the illustrations are drawn mostly from technological settings, the principles of knowledge creation, formulation into usable products and processes and use in an internal corporate or external market, apply to innovation in general. An underlying theme running throughout the book is managing the flow of knowledge that propels innovation—especially tacit knowledge. Such knowledge is difficult to transfer or embody in a new product, process or service. However, it is not only essential but often comprises the most valuable component in the innovation. When Sparks Fly: Igniting Creativity in Groups. Most writings on creativity focus on individuals—the “creative types” that managers often rely on for really novel ideas. In When Sparks Fly, Dorothy Leonard and Walter Swap argue that most important innovations come from groups, and that groups can be managed to maximize creativity. Merging their backgrounds in business and psychology, Leonard and Swap develop a multistage process to enhance creative output. They demonstrate the importance of composing the group to maximize “creative abrasion”—selecting members whose varying backgrounds and thinking styles can promote productive intellectual (but not personal) clashes of ideas. They then show how group leaders can manage this diversity to develop a range of creative options, to arrange for periods of incubation, and to converge on a final innovation. In two final chapters, the authors discuss ways in which the psychological and physical environments can be managed to further promote group creativity. Awarded “Best Book on Creativity” by the European Association for Creativity and Innovation, this volume addresses the generation of knowledge–how the creativity of any group can be enhanced by the right management. David M. Kelley, founder and former CEO of IDEO Product Development, Engineering Design Professor, Stanford University. Deep Smarts: How to Cultivate and Transfer Enduring Business Wisdom. One of the great challenges facing organizations is how to retain the knowledge and expertise of their most valued employees. These are the people whose long experience enables them to recognize complex patterns, make fine distinctions, and utilize a large repertoire of tacit knowledge to make rapid, wise decisions. These are people with “Deep Smarts®”, and when they leave the organization their smarts usually go out the door with them. Drawing on a multi–year, international research project observing and interviewing experienced coaches and venture capitalists and their protégés, Dorothy Leonard and Walter Swap explore how Deep Smarts® develop, how they are shaped not only by education and experience, but by beliefs, values, and social influences. They then turn to the critical issue of how Deep Smarts™ can be transferred to (or, more accurately, re–created in) those less experienced. The most powerful mode of knowledge creation and transfer is through guided experience: practice, observation, problem–solving, and experimentation under the guidance of an experienced knowledge coach. Who are the “go–to” people in your organization–the ones sought out for advice, good decisions, expert diagnoses? How do such individuals come up with “intuitive” solutions that stump others-and do it so quickly? What if your top technical expert or your best sales person resigned? Would someone else be able to make the same nuanced judgments? How can you ensure that the knowledge that made you successful isn’t being lost? What’s the cutting edge in knowing how to transfer experience–based expertise? Wellsprings of Knowledge: Building and Sustaining the Sources of Innovation. Why are some companies better at managing innovation than others? Basing her prescriptions on extensive, in–depth studies of technology–based companies, Dorothy Leonard probes the relationship between successful innovators and the way that they create, nurture and grow the experience and accumulated knowledge of their organizations. An organization's core capabilities, Professor Leonard argues, are interactive systems of knowledge that enhance competitiveness but can also function as core rigidities, inhibiting innovation and stifling growth. Her book provides guidance that can immediately be put into a manager's working business plan. “An original and elegant thesis provides an actionable framework for competing in a world where value resides in ideas."